July | 2010 | Great Auk - or Greatest Auk? While I am out of blogging commission traveling the country, Jonathan Franzen has nobly agreed to take up my slack! Well, not really. But he does have an article in the current New Yorker about bird poaching in Cyprus, Malta, and Italy. Artistic differences note: If I were him, I wouldn’t have eaten the ambelopoulia. When it’s too hot to go outside, it’s too hot to bird. Fortunately, I still have some interesting observations from the Old Homestead to serve with slaw and mustard on this holiday Monday! This year I have finally succumbed to the lure of the Odonata, those cheerfully menacing insects who are at their best just when the birding is at its worst – in the middle of the day, in the middle of the summer. Although I am still a dragon- and damselfly neophyte, I was able to identify a few species with confidence. Most notably, there were a very large number of Ebony Jewelwings around the wooded creeks on the property, probably encouraged by a wet and therefore mosquito-iferous late spring. These dragonflies, which are fully as beautiful as their name, let me get close, but unfortunately not close enough to get a decent picture with my phone. Another species I was able to put an actual name to was the Eastern Pondhawk, and an apt name it was, since I spotted one near the pasture pond. A gorgeous grass-green female adorned with black, to be specific. The Pondhawks hawk flying insects, and are hawked in turn by the abundant Eastern Kingbirds in the pasture – and this summer, by a Great Crested Flycatcher, a species that makes perfect sense for the Olde Homestead from a habitat and range standpoint, but which I had never observed there before*. Also new to the Olde Homestead was a singing male Chestnut-Sided Warbler. I’m unsure whether he was a late migrant or a sincere would-be breeder, but either way, he was good to see. Since Chestnut-sided Warblers like early-succession forests, his presence was in keeping with the general changes taking place in the area, and with the continued absence of my old friends the Bobolinks (despite what to my eye looked like substantial patches of remaining good habitat). And speaking of absences, those Hooded Warblers that were so ridiculously abundant last summer? I couldn’t find a single one. Maybe it was an artifact of the way the biting insects drove me out of the woods relatively quickly (see ‘wet late spring’ above), or maybe it was a genuine lack, but either way, no Hoodies for me! *unless one attributes the Probably-Erroneous Western Kingbird Sighting Incident of 1995 to an unusually grayish GCF, but we don’t like to talk about that. 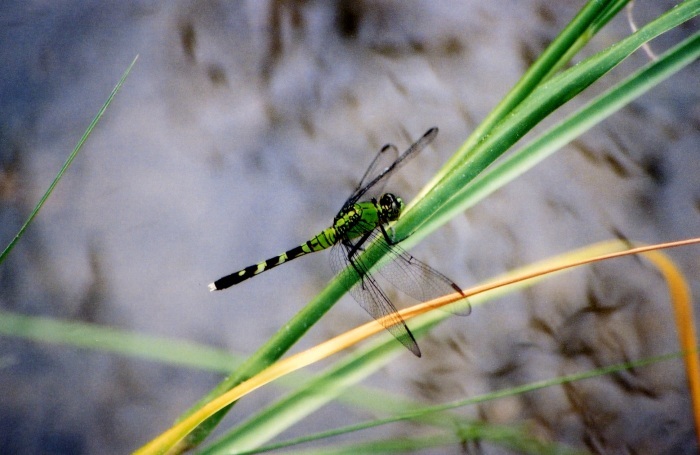 Eastern Pondhawk image by Mary Hollinger, courtesy of The National Oceanic and Atmospheric Administration.